Check out Bingo Bonanza Game Now & win loads of cash! Step 1: Adjust your starting stake in Bingo Bonanza by clicking on the +/- buttons under the stake option at the bottom of the screen. Step 2: You must now choose how many cards you wish to play with, you can have up to eight! Step 3: If you're happy with your Bingo Bonanza stake then hit the big yellow play button. That is about it, it really is as simple as that! 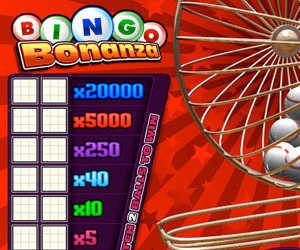 Bingo Bonanza is yet another one of Microgaming's takes on the popular original game. Ever trying to freshen up a genre that doesn't particularly need freshening up, they have created another simplistic looking game, that acts as more of a lottery than a bingo game. True enough though, Bingo Bonanza is pretty to look it, it is energetic and good fun. The basic rule of the game is the same as any other bingo spin-off. You'll need to match the numbers on your cards to those drawn by the game in order to win big. How big? Well how does 20,000 times your stake suit you? Anything you win in Bingo Bonanza will be accurately displayed in the appropriate pay table, and it shouldn't take too long to occur. When bingo games are often played in quick succession it may take several cards before you pick anything up, but not to worry, depending on your rate of play, it might not be that long! The Bingo Bonanza game isn't the most gripping in terms of play-ability, but it does offer you fairly generous payouts for truly minimalistic work on your part. This makes the game likable and a step ahead of other more complicated bingo games. You can get your hands on the Bingo Bonanza demo to play Bingo Bonanza for free and give it a test drive before you put your coins in. Remember what I've said about play-ability though!